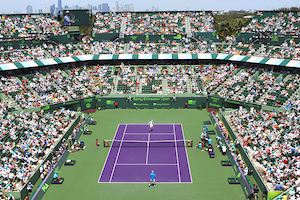 The recipient of the Sony Ericsson Open men’s trophy will be decided this afternoon as Andy Roddick and Tomas Berdych clash in the finals. That will be followed by the WTA doubles final. The winner in Brisbane, this is Roddick’s fourth final of the year. However, in his first ATP 1000 Masters’ final in Indian Wells, Roddick was disappointed by Ivan Ljubicic. The victor in Miami in 2004, Roddick will attempt to capture his second championship in South Florida. If Roddick succeeds, it will be his first Masters’ title since 2006 in Cincinnati and the 29th of his career. After prevailing over Roger Federer, Fernando Verdasco and Robin Soderling to advance to the finals, Berdych tries to put the cherry on this spectacular run with his first title of the year. Moreover, Berdych is in his first ATP Masters 1000 final since 2005 in Paris where he was triumphant. In contrast to Roddick, not only is this Berdych’s first final of the year, he is trying to collect his 6th career title. The Czech is 2-5 lifetime versus Roddick and has already lost twice to him in 2010. While Berdych has a record of 5-4 in finals, Roddick is 28-19. With the prior wins and the vast differential in experience, Roddick is the clear favorite. The tournament ends with the women’s doubles with the new team of Samantha Stosur and Nadia Petrova, seeded 3rd, taking on the duo of Gisela Dulko and Flavia Pennetta. For Stosur and Petrova, this is their second consecutive final, they were defeated two weeks ago in Indian Wells. In 2006-07, Stosur won the championship with Lisa Raymond and in 2004 Petrova carried it with partner Megan Shaughnessy. Petrova and Stosur have a combined 40 doubles titles. For Dulko and Pennetta, this is their initial final at the Sony Ericsson Open. In addition, that tandem possesses a total of 15 trophies. Again, because of their wealth of experience, the 3rd seed have a distinct advantage. The grand duel predicted between Venus Williams and Kim Clijsters in the Sony Ericsson Open Final never materialized. Instead, it was a 58 minute blow out as Clijsters ran away with the match 6-2, 6-1 to gather her second championship trophy in Miami. After the semifinal with Justine Henin where Clijsters almost let the match get away, Kim knew that she would need to be well focused for the finals. That’s exactly how Clijsters came out. From the first game, Clijsters placed Venus’ serve under fire with two errors at 0-30. Despite recovering to hold, this was a glimpse of how the rest of Venus’ day would unfold. With Venus unable to find a first serve, Clijsters punished a second serve, forcing Williams into a forehand miscue for break point. With another forehand error by Williams, Clijsters obtained the break for 2-1. During the change over, Venus briefly called the trainer to re-wrap her left knee and right thigh. Despite two double faults the subsequent game, Clijsters managed to get enough help from Williams in terms of mistakes to consolidate for 3-1. The thinking was that Williams would rise up and challenge; however, that did not happen. Up 40-15, Venus botched an overhead then double faulted for deuce. Williams also threw in a second straight double fault to give Clijsters break point. When Venus netted the volley, Kim had a double break edge at 4-1. Thus, Clijsters sprinted away with the first set. Still, the torture was only beginning for Williams. Subsequent to starting the second set with a double fault, Venus faced break point when a backhand crosscourt traveled long. Despite erasing that with a good serve for deuce then getting to game point, Venus could not string together two consecutive points. With a forehand up the line winner, Clijsters arrived at her second break point. Venus allowed Clijsters the easy road to a second set lead by double faulting. Following Clijsters consolidating with a love game, Williams shoveled herself into a 0-30 ditch. At that moment, the crowd demanded a response from Venus with a round of applause. Yet, this was to no avail. Williams dumped another backhand into the net to face triple break point. Unlike her match with Henin, Clijsters was not in a charitable mood. Kim provoked a forehand crosscourt mistake from Venus to again widen the gap by a double break . Next, with a backhand down the line winner, Clijsters grabbed an impressive 4-0 lead. The subsequent game, Venus at least held to make the score respectable. However, serving to lengthen the match, Venus committed her 29th unforced error to hand Kim triple match point. With another flying forehand by Venus, Kim won the championship. Q. Were you having timing issues with [your] serve today? WILLIAMS: No, . . . I think it was more or less my groundstrokes. . . on my serve I go for it a lot, so that’s kind of the norm. . . I did start missing more first serves in the second set, so that didn’t help my cause. Q. Is it surprising to see how well Kim and Justine have done after their comeback and to just be able to go through a lot of top ranked players right off the [bat]? WILLIAMS: Yeah,. . . they’re playing really, really well. This is just great and amazing for them. They’re playing great. After the match, Clijsters had this to say in reference to competing against someone who is struggling: ” you constantly have to tell . . . and remind yourself to really keep [being aggressive and move forward], especially when you see that you have a second serve . . . it’s easier when things are really exciting and you’re both playing really [well] . . . you almost have to be dominant and . . . bring your best level. But, when you feel like your opponent is not giving [her] best tennis or bringing [ her] best tennis, you just really want to try . . . not focus on [her] too much and just really focus on yourself. [To] try to keep focusing on what you’re doing well. For Clijsters, this win represents her 37th career title and her second of the year. Kim prevailed in Brisbane over Justine prior to the Australian Open. Clijsters’ ranking will move from 16 to 10 on Monday. As a result of this defeat, Williams’ 15 match winning streak come to an end. Regardless, Venus will get a slight bump in the ranking from 5 to 4. Marcos Baghdatis got his Australian Open campaign off to a spectacular commencement. At the Medibank International Sydney, the 2006 Australian Open finalist prevailed over Richard Gasquet 6-4, 7-6. Gasquet had a jittery opening service game. After a backhand down the line error wiped out game point, Gasquet flubbed an overhead and sent another backhand long handing Baghdatis the early break. Marcos had no difficulty consolidating for a 2-0 lead. On many occasions, Gasquet pushed Baghdatis to deuce after the latter had game point. However, with errant strokes, Gasquet did not get far. The tides shifted in the sixth game when serving at 3-2 and deuce, Baghdatis botched an easy forehand after a well placed wide serve to allow Gasquet his first break point opportunity of the match. Still, Gasquet failed to take advantage, dumping a forehand into the net. Ultimately, Baghdatis held on for a 4-2 lead and closed out the set with an exemplary game. With Gasquet at 30-0, the initial game of the second set was interrupted by rain. When the Frenchman returned, he stumbled but still maintained serve. Perhaps, calmer after the interlude, Gasquet was now tracking down dropshots that Baghdatis had poured on for winners in the first set. As Baghdatis served at 1-2, he misconnected on a forehand up the line giving Gasquet break point. Although Marcos forced Richard into a backhand error erasing that break point. Unable to stick enough first serves, Baghdatis eventually double faulted donating to Gasquet the break. But, a 5-2 lead was not sufficient for Gasquet to wrap up the set. After Baghdatis held easily at 3-5, with an excellent crosscourt pass, an unsuccessful tweener by Gasquet on a superb lob and another misfired backhand by his rival, Baghdatis had triple break point. 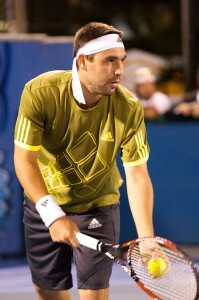 Baghdatis was back in the set after Gasquet netted a forehand. Subsequently, with each player holding serve, the set went to a tiebreaker. With a beautifully angled backhand crosscourt winner, Gasquet had a minibreak at 2-0. Yet, with two successive double faults, Gasquet’s edge evaporated. Thereafter, Richard folded. Gasquet did not win a single point, permitting Baghdatis to run away with the tiebreaker and the championship. Despite the lost, Gasquet’s game is on the right path in light of the cocaine scandal which curtailed his 2009 season. Last week, Gasquet was a quarterfinalist in Brisbane. Armed with a new coach, Baghdatis has been revitalized. For the Cypriot, this is his second title in three months after a previous drought of two years. Now, Baghdatis is hoping that he will carry this momentum to Melbourne. After an unforgettable tussle into the wee hours in 2008, Baghdatis appears once again on a third round collision course with Lleyton Hewitt. If his Sydney victory is any indication, Marcos appears fit for another rumble.